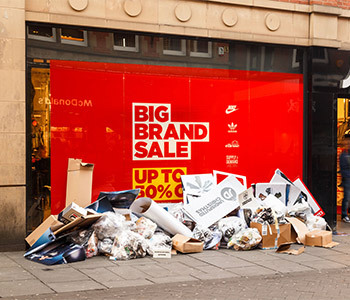 As a professional rubbish removal company, Shop Clearance is just one of our many rubbish clearance services on offer. We undertake shop clearance throughout Sydney. Whether you are a small scale independent shop, or a larger chain business, we are the people for the job. We provide shop clearance services in Sydney, which can consist of anything from clearing old stock and rubbish, to ripping out carpets, fixtures and fittings. We hold a full license for collecting and disposing of rubbish in Sydney, and so you can rest assured that all the rubbish from the shop clearance we undertake will be disposed of legally and responsibly. We always dispose of the rubbish we clear in the correct manner, recycling the materials wherever possible with the environment in mind. We make life easy for you by taking all the rubbish and unwanted items we clear, ultimately leaving you with a tidy and empty shop. When you hire our shop clearance services, you can rest assured that we will be taking all the cleared junk away, and not leaving anything behind unless specified. We work fast, and we work tidily. Get in touch for a no obligation free quote. We are able to work to deadlines, and always aim to fit in around your needs as a customer. Because of this we have gained an excellent customer service reputation, and many of our customers refer their friends and business contacts. If you are looking for a shop clearance in Sydney, be sure to make us your first port of call, and see exactly what we can do for you. With much experience in undertaking hotel clearance, house clearance, and restaurant clearance, in addition to our shop clearance services, we are fast when it comes to the job at hand, and you can be sure we know exactly what we are doing in order to complete a smooth clearance.